EARRINGS - SARAH COVENTRY. "MOONLIGHT MADNESS" FROM 1961. 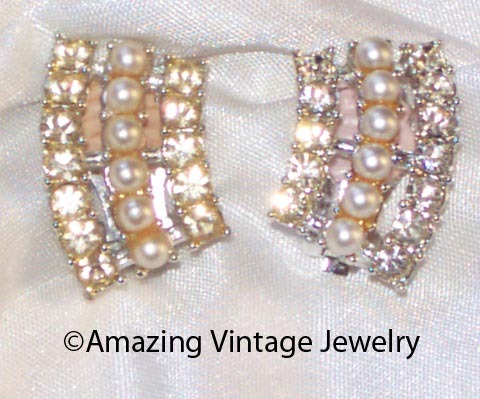 EXQUISITE SILVERTONE FRAMES WITH A CURVED ROW OF FAUX PEARLS AND A ROW OF SPARKLING, CLEAR RHINESTONES ON EACH SIDE. ABOUT 1 1/16" LONG, 11/16" ACROSS. 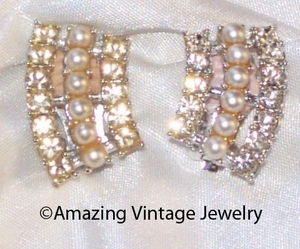 VERY GOOD CONDITION WITH SOME YELLOWING TO THE RHINESTONES AND GLUE AROUND THE BASE OF SOME OF THE FAUX PEARLS.